Pratt & Whitney celebrated the inauguration of a newly renovated engineering centre in Aguadilla, Puerto Rico. The celebration also included a US$500,000 donation by Pratt & Whitney to the University of Puerto Rico at Mayaguez. Puerto Rico Governor Ricardo Rosselló and representatives from the Puerto Rico Industrial Development Company (PRIDCO) attended the ceremony alongside several Pratt & Whitney executives, including members from parent company United Technologies. 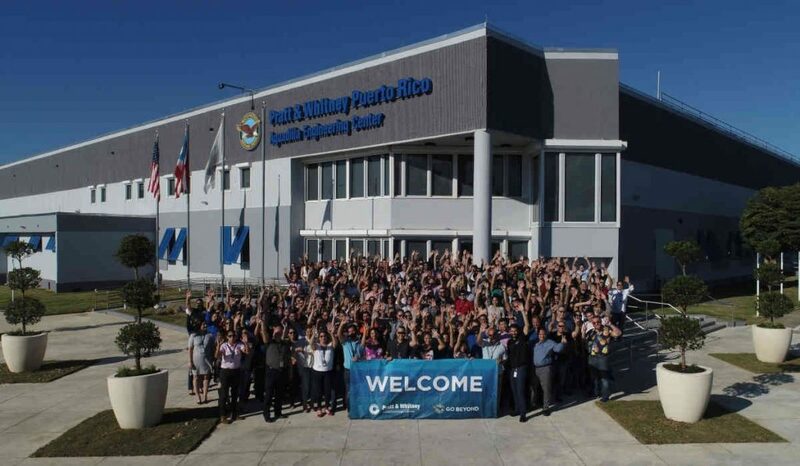 The renovated US$14 million facility, made possible through a collaboration with PRIDCO, measures 104,000 square feet and houses more than 800 Pratt & Whitney Puerto Rico employees with the capacity for 400 more. The facility, according to the company, is on track for LEED Silver certification based on environmentally progressive design features. Pratt & Whitney Puerto Rico Inc., formerly Infotech Aerospace Services, Inc. (IAS), designs, evaluates and supports Pratt & Whitney’s commercial and military gas turbine engines, including the Geared Turbofan (GTF) engine. Since entering into service in early 2016, the GTF engine, according to the company, has demonstrated an ability to reduce fuel burn by 16 per cent, to reduce NOx emissions by 50 per cent to the regulatory standard, and to lower a noise footprint by 75 per cent. Since Hurricane Maria in September 2017, Pratt & Whitney explains its employees around the world have been committed to relief efforts through a combination of financial contributions, donation events and volunteerism. Local employees have helped more than 600 families in eight towns by distributing food and personal items and by volunteering to repair damaged homes. As part of its commitment to Puerto Rico and its people, Pratt & Whitney explains it also presented a donation of US$500,000 to the University of Puerto Rico at Mayaguez. The donation will be used to fund an aerospace teaching laboratory to train the next generation of mechanical and electrical engineers in the propulsion design and development.